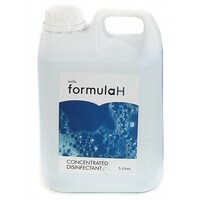 Formula H Concentrated Disinfectant is a quality assured and recommended for use by veterinary professionals and top breeders. When used correctly, this disinfectant is completely safe, while retaining extremely effective and economical properties. As well as being an effective disinfectant, Formula H also kills airborne viruses at regular intervals and does not evaporate instantly for a controlled rate of cleansing. Use only once per day and read all instructions carefully to make sure you have the correct dilution.